form of variety die, trails / wavy steps. considered a design extension or a continuation of the design affected. anomaly, ranging in date from 1982 to 2007 and from all three MINTS. 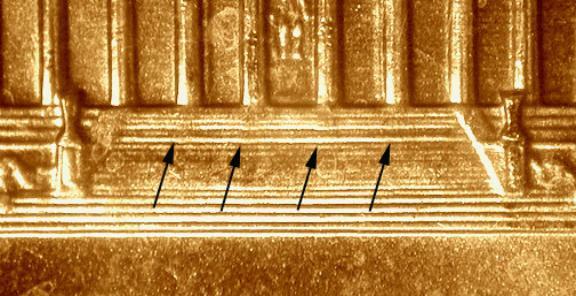 The picture below is the strongest wavy step Lincoln cent known to date, it even affects the lowest step. From 1999, this is listed as die # 15.
the letters in EPU, with an offset direction of 060º. The above picture shows trails from the letters of LIBERTY in an example of this type of anomaly.